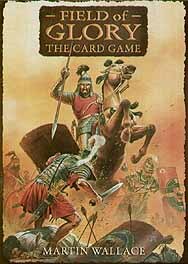 Enter the world of ancient warfare in this exciting card game for two players based on the best-selling Field of Glory miniature rules. First you must design an army to defeat your opponent through careful card selection. Your aim is to take control of the battlefield by capturing terrain cards. Use Command Points to deploy your troops and turn the tide of battle. Slow moving troops cost more Command Points than faster ones, but hit harder in combat. Tempo is crucial to good play and if you find yourself with too few cards you leave yourself at the mercy of your enemy. Field of Glory: The Card Game plays quickly, so you can play a series of battles in a single sitting.